Microsoft is reducing pricing to its Operations Management Suite by as much as 40 percent until the end of the year. Workloads moved to the cloud must be managed properly, so Microsoft has released new tools to help system administrators bridge their in-house data centers with Azure services. The company has released an add-on for managing cloud workloads within the company's System Center systems management suite. It has also expanded the range of backup options for hosting data and applications in the cloud, positioning Azure as a disaster recover system or as an alternative to backing up resources to tape. The new add-on provides a way to access Operations Management Suite (OMS) capabilities from within System Center, used by many administrators to keep track of in-house hardware and software. Introduced earlier this year, OMS is Microsoft's software for managing cloud resources. It provides capabilities for automating routine operations, and for keeping track of the performance of cloud workloads. The new OMS add-on provides a way to manage cloud services from within a System Center console, reducing the number of interfaces an administrator must work with. Combining the two software packages could be useful for testing new software in the cloud, or for using the cloud to accommodate increased demand for a popular application, Microsoft said. This OMS Suite for System Center suite will cost US$717 a year for the enterprise edition, and $3,585 a year for the data center edition. Through the end of the year, Microsoft will discount the software so it costs $430 per year for the enterprise edition and $2,150 per year for the data center edition. 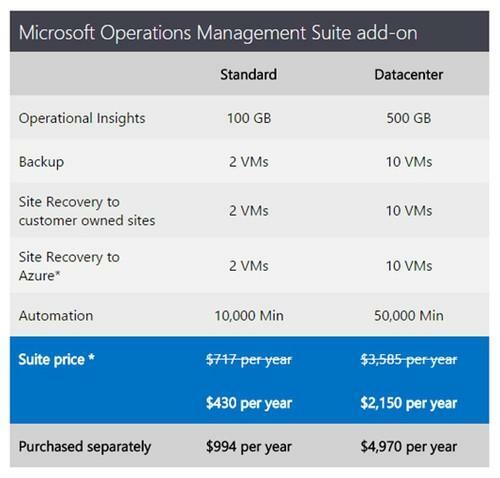 The add-on also is less expensive than purchasing OMS separately, which runs $994 per year for the enterprise edition and $4,970 per year for the data center edition. In addition to releasing the OMS package, Microsoft has also expanded its Azure Site Recovery cloud services for making system back-ups, for purposes of disaster recovery and maintaining continuity of operations. The company developed a new agent and console that streamlines the back-up routine. If an organization's primary data center goes offline, it can quickly switch to a backup copy stored on Azure to minimize downtime. The company has also been working on improving backup options for System Center as well. The System Center 2012 R2 Data Protection Manager add-on was designed only to back up Microsoft applications, such as Hyper-V virtual machines. It now has been updated so it can back up VMware virtual machines as well. These resources can be backed up to either disk, tape or the cloud.